Indonesia is the largest Muslim country in the world and has traditionally been regarded as secular, but now there is a strong drive to “become more Islamic.” This movement is growing and includes the usual lies being spewed to the Indonesian public, about Islam being oppressed by “foreign powers” and that “Islam will protect everyone, it will not oppress anyone.” Really? Well, for starters it will stone gays, oppress women, and murder apostates, and more. Last month “at least two women were left unable to walk after a brutal public whipping in Indonesia as punishment for alleged intimate relations outside marriage, with a total of six couples subjected to the brutal ordeal, carried out in accordance with Sharia law.” And just days ago, a Muslim family was sentenced for jihad suicide bombings. With the trend toward greater Islamization of Indonesia, expect to see more persecution of Bali Hindus and other minorities, and other human rights abuses and barbarism. 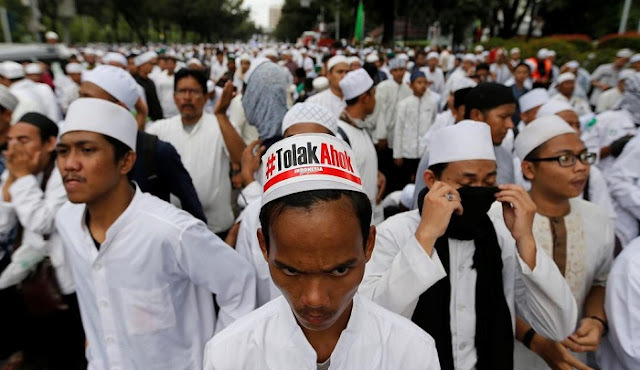 More Muslims live in Indonesia than anywhere else in the world, and on April 17, the country is electing its next president. Since Indonesia embraced democracy in 1998, it has provided a strong example of the separation of religion and state.